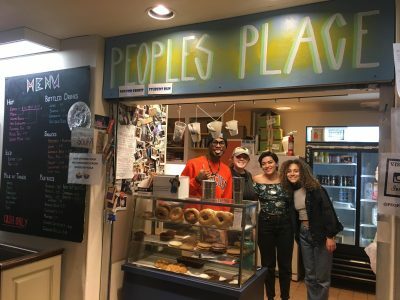 The People’s Place Cafe grand reopening celebration on Friday will feature samples of soup, sandwiches, and macaroni and cheese. Plus, new travel mugs and stickers will be available for purchase. People’s Place Café is celebrating the completion of renovations and the addition of Brooklyn Pickle soups and sandwiches to its menu. The student-run, not-for-profit coffee shop, located in the lower level of Hendricks Chapel, invites all members of the University community to check out its fresh new look and new menu options at a grand reopening celebration on Friday, Feb. 8, from 2 to 5 p.m. The event will feature live music from student musician Charlie Burg ’19 and a DJ from WERW; free small drinks; Brooklyn Pickle samples and giveaways. The celebration highlights a period of growth at People’s Place Café, which was established in 1971. The renovations, completed over Winter Break, are already helping the café better serve students, faculty and staff who line up throughout the day for the café’s organic, fair-trade, hazelnut coffee and other offerings. Fresh paint, a new pastry case, an updated refrigerator and an ice machine are just a few of the renovations that have been made. The construction team also worked with the student managers to preserve some of the iconic painting and artwork on the original cabinets in the addition of new storage space. Partnering with the iconic Syracuse sandwich shop Brooklyn Pickle, People’s Place Café now serves a daily variety of Brooklyn Pickle sandwiches and soups, plus macaroni and cheese on Fridays. The connection between Hendricks Chapel and Brooklyn Pickle has deep roots. Craig Kowadla, co-owner of Brooklyn Pickle, grew up as a big fan of Hendricks Chapel. His late father, Harry Kowadla ’65, was a Syracuse alumnus who was deeply involved with the Alibrandi Catholic Center while on campus. He even served as an altar boy for the late Father Charles Borgognoni, the University’s legendary Catholic chaplain. The Alibrandi Catholic Center also hosted Harry’s memorial service in 2007. “My father loved his Syracuse experience, and Father Borgognoni was a big part of that,” Craig Kowadla says. His father loved Hendricks Chapel so much, in fact, that Craig named his second son Hendricks, in honor of Harry’s memories of the chapel. Craig says its “pretty cool” to be serving his food where his father spent so much of his time on campus. People’s Place Café staff will hand out samples of soup, sandwiches, and macaroni and cheese during the grand reopening celebration to give patrons a taste of the new menu. There will also be new travel mugs and stickers for sale at the event. People’s Place is cash-only, but there are reloadable gift cards available for the convenience of customers.